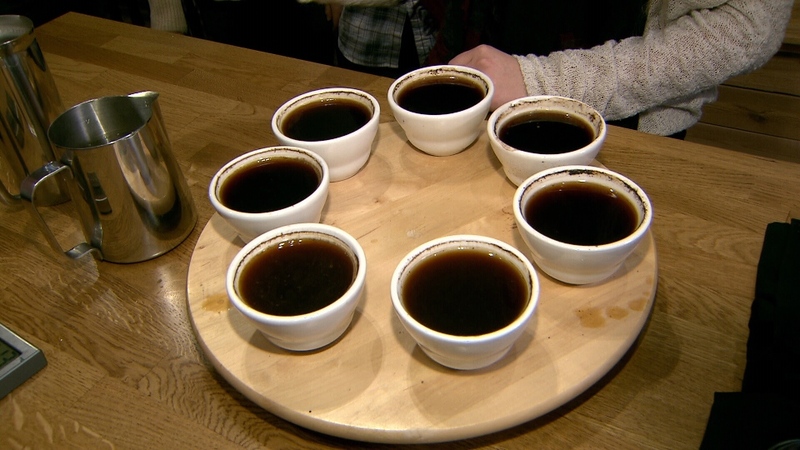 Putting coffee to the test: Does pricier java really taste better? How does convenience store coffee stack up against high-end beans or familiar names like Tim Hortons and Starbucks? The McLaughlin on Your Side team took some regular people, set them up with a quick lesson in coffee tasting and in a blind taste test they surprised themselves in what they chose. Canadian Barista and Coffee Academy founder Les Kuan gave our tasters a class in what to look for when sipping brewed coffee. To keep it simple, the focus is on sour, sweet and bitter. “Coffee is not created equal. Poorly roasted coffee, poorly prepared coffee is often bitter,” explained Kuan. So how do the beans we chose stack up? We tested two types of coffee from a local roaster, two from Starbucks, and one coffee each from McCafe, 7-Eleven and Tim Hortons. Nothing was added to the beverages. “Do you expect there will be a difference between all of these?” asked McLaughlin. “Oh, there will be a difference,” answered Kuan. Barista instructor Jake Moss led the test. Our testers all sniffed the coffee grinds, then Moss skimmed off the grounds with a spoon. Each tester was given a spoon to dip into the coffees and slurp. “This one’s a little bitter,” said Jessica. “Oh yeah, this one’s definitely bitter,” agreed Daniel. They analyzed each one, from cup to cup. Then they went around again taking a second try at each of the seven cups. "There's a bit more sour component to this one," said Brandy. “That’s very fruity,” said Alex after sipping from one of the cups. All of the tasters agreed on the top three, with the clear winner being Latif Tanzania by local coffee roaster Modus. The second favourite, was the corner store coffee. “That’s the 7-Eleven Columbian,” revealed Moss. Modus picked picked up third place as well, with its Dom Columbian coffee. The least favourite of the bunch among all the tasters was Starbucks Pike Place. The other coffees fell in between, somewhat nondescript. "I definitely will be checking out more independent roasters and coffee shops," said Brandy. "I learned we should check out 7-Eleven's coffee because it was my second choice," said Daniel. "All my co-workers go to 7-Eleven instead of Starbucks and now maybe I'll starting doing that too," Jessica said. The two coffee experts picked the same top three as our amateur tasters, but just a different order, with the two Modus roasts coming out on top and 7-Eleven in third place.